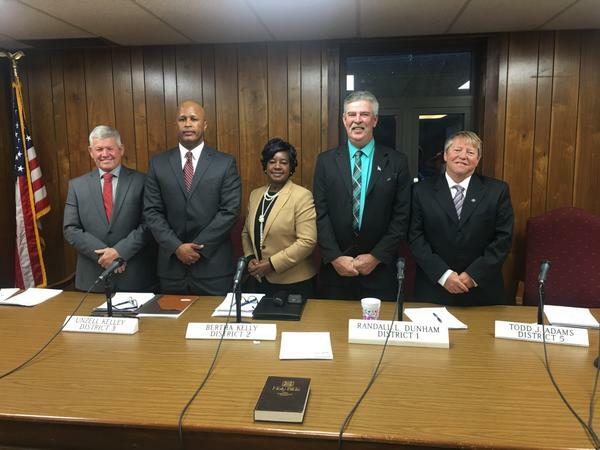 The Coosa County Commission is the governing body of the county, establishing goals and objectives to direct the county's growth and development, and carries out other responsibilities as set forth by Alabama statutes. The County Government is administered by a five-member County Commission representing the five county districts. The Commissioners are elected within their respective district and serve four-year terms of office. The Commission oversees county operations and enacts ordinances and resolutions to promote the health, safety, and welfare of citizens and businesses in the county, and approves the annual budget and millage rate which funds the operations of the offices and departments under the Commission's jurisdiction. The Commission meets on the second Tuesday of each month in the Coosa County Courthouse. If a regular scheduled meeting falls on a holiday, the Commission meets on the next working day following the holiday. The Commission also schedules additional meetings as they deem necessary to handle pertinent County business and in the case of emergencies. All meetings begin at 9:30 AM, unless otherwise announced, and are open to the public. If you wish to appear before the County Commission to discuss an important matter pertaining to the county, you must notify the Commission Office not later than noon on the Wednesday prior to the Tuesday meeting (download request here) . Any backup information and/or exhibits pertaining to the matter you wish to discuss must be delivered to the Commission Office by the same deadline. If you have been scheduled to appear before the Commission, or if you have a matter to be discussed and you would like to have it dismissed from the agenda, please contact the Commission Office prior to the beginning of the meeting. Click here to view the Commission Agenda and Minutes.